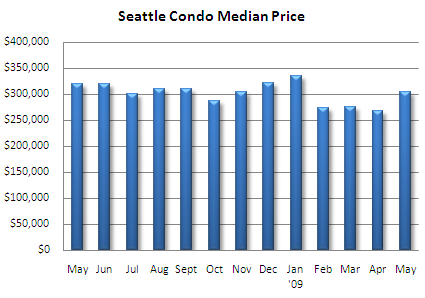 Seattle’s median condo price came in at $304,000 in May, a one month increase of 13.4% assisted by increased sales volume. 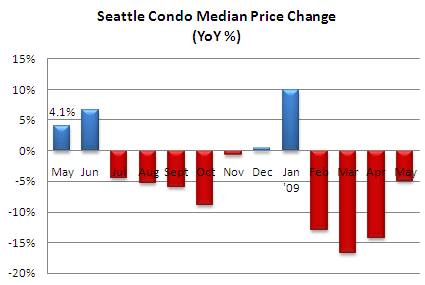 Compared to last May, however, the citywide median price slipped 5.0%, though the margin has narrowed considerably. 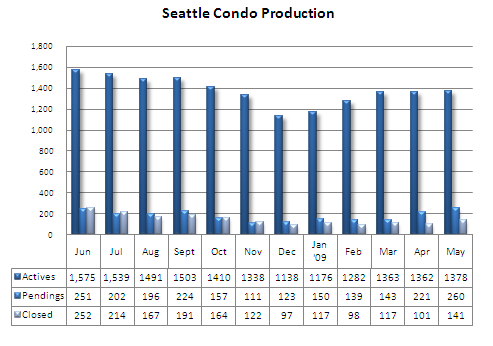 There were 260 units that went under contract last month, up 17.6% over April but down 0.8% compared to May 2008. Much has been mentioned lately that the year-over-year stats are skewed due to a classification change that increased the number of listings under the “pending” status category, therefore, making year-over-year comparisons inaccurate. And, that’s true. 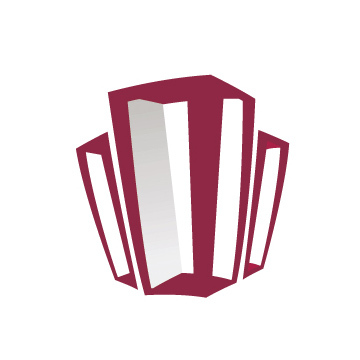 Last June, the NWMLS eliminated the “subject-to-inspection” classification and merged it into a new “pending inspection” category. Prior to July 2008, properties under contract were classed as “subject-to-inspection” first, then after the inspection was completed, changed to “pending”. Since then, properties going under contract are classed as “pending inspection”, thus, increasing the number of properties categorized as “pending” in the NWMLS statistics. That said, though, there’s technically no difference. Whether a property is classified today as “pending inspection” or last year as “subject-to-inspection” the fact remains that an offer was placed and a contract was mutually accepted on the property. In any case, in another month, the issue will resolve itself. The 141 closed sales in May reflected a one-month increase of 35.6% and a year-over-year drop of 35.3%. The number of closed sales relative to the number of pending properties in the prior month have been widening. Typically, properties close about 30 days after going under contract, therefore, we expect that the number of closings in the current month to closely match the number of pendings in the prior month. In May, the number of closings was approximately 64% of the number of pendings in April. Two factors may be contributing to this gap. First, lenders have been swamped with refi’s, which have resulted in longer approval time frames for purchase loans. We’ve seen lenders take up to 40-45 days to approve a run-of-the-mill purchase loan. Second, the number of short sale transactions have risen considerably and they can take anywhere from 2 to 4 months to close. Plus, quite a few are never approved and fail to close. There were 1,378 active listings in May, up just 1.1% over April and down 17.1% compared to May of last year. With the number of listings plateauing combined with increasing sales volume, the citywide condo inventory supply rate, also known as absorption rate, improved in May to 5.3 months, the lowest level since November 2007. 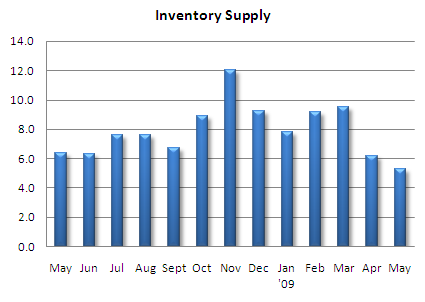 What this means is that if there are no new listings it will take 5.3 months to exhaust the current supply. 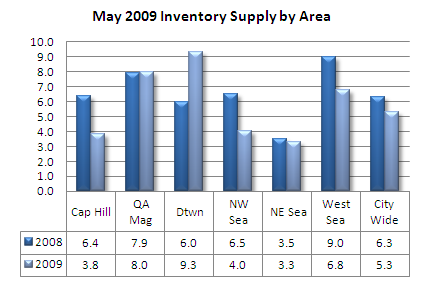 We use this rate to classify market conditions; at 5.3 months of supply, Seattle is reflecting a normal-to-buyer’s market conditions. As mentioned last month, market conditions vary by price points and locale. Under $300,000 we’re moving towards a seller’s market while for those priced over $500,000, predominately in the downtown area, we’re entrenched in a buyer’s market. The recent bump in mortgage rates may affect sales since an increase in rate will decrease buying power. That can persuade some buyers from buying. However, while we may not see interest rates fall below 4%, it’s still quite low comparatively. For first-time buyers, if you’re considering taking advantage of the $8,000 tax credit, the November 30th deadline is approaching. 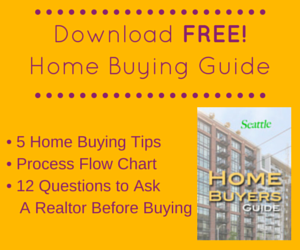 One item to keep in mind, though, is that with the Thanksgiving holiday weekend and King County’s furlough day on the November 25th, home buyers will essentially need to close on their purchase by Tuesday, November 24th. That leaves about 4.5 months to get under contract. 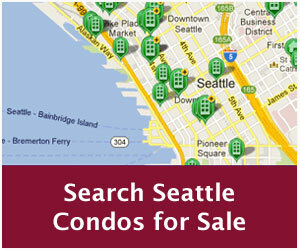 It looks like Seattle as other areas of the country are getting off the bottom. Our market in Bergen County New Jersey, a suburb of NYC is doing better also, however at lower prices. If you list it right however you will get multiple offers. We had not seen that for a while.